A new product called Pennies for Products has recently launched, claiming some amazing results,with leads costing just “pennies”. I decided to write a review, but to be upfront: this had very familiar SCAM characteristics to it, so I did not even waste my money on it. But stay with me, read on and all will be revealed. What is Pennies 4 Profits and how does it work? P4P is a lead generation service. According to their sales page, you will receive 100 high quality leads every 24 hours that you can download every day, plus the ability to add the leads to their own spam compliant built-in mailer. The leads are supposed to be high converting and targeted to the Internet Marketing and Business Opportunity niches. Fresh Factor Date (indicator of how current the lead is). 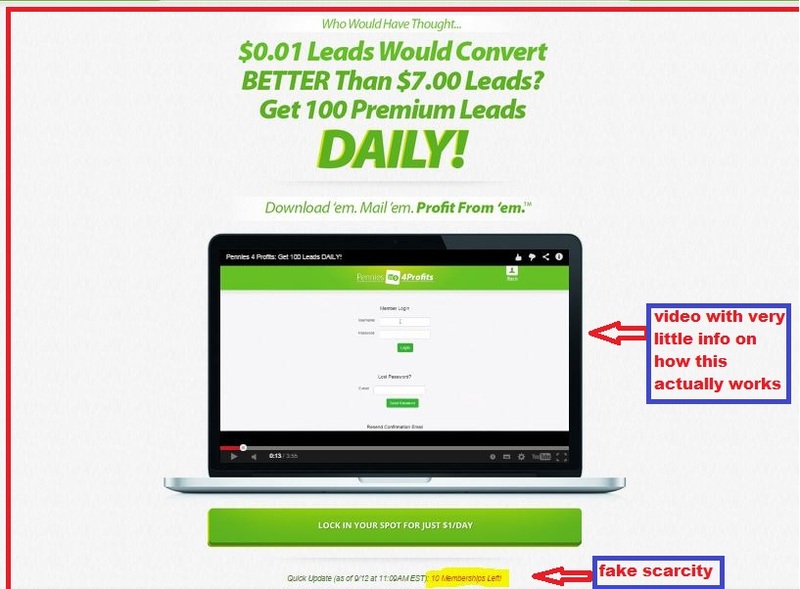 However, exactly what is the source of these $0.01 leads that convert so great? That is the one thing that remains their “secret”, and you are completely relying on their integrity on that matter. How much does Pennies 4 Profits Cost and is there a refund policy? To get a membership for this you will need to fork out $30 up front as a setup fee, plus another $30 monthly subscription fee. Their sales pitch will try to convince you this is a small investment for the value you are getting, but it’s still a lot considering that you are paying $60 before you have even seen what you are getting for this, and before you can test it. The Refund Policy states that you may request a refund up to 24 hours after your initial purchase. Not enough time to properly evaluate the product at all. Tired of paying for products that turn out to be scams? Click here to read about the only true “try before you buy” product in internet marketing. How do I know that Pennies 4 Profits is a scam? If you are asking yourself how I can review this product and label it a scam when I have not actually bought it, you would be right to do so. But Let me explain though how I can be so sure. You see, I have previously paid and tried out 2 products that turned out to be scams, which show an alarming amount of similarities to Pennies 4 Profits. These products are called Submission Works and Twice Confirmed Traffic. Fake scarcity – always some claim that there is limited availability, or an increase in price. But that never happens, the counters reset periodically. Classic sales pitch to convince potential customers to buy by creating an artificial fear that they will lose out on great opportunity. Identical refund policies – The refund policies on all 3 products are exactly the same: 24 hours within initial purchase. Too exact to be a coincidence. I ran the website through Alexa, and it seems that less than 1% of their traffic comes though search engines. For a company that claims to be “widely known as the highest quality lead provider in the USA and worldwide” (from the sales page), this does not add up. It means that their website visitors are coming from direct marketing, probably email marketing. A well-known company would have a significant amount of organic search engine traffic. On the discussions that I have found on forums, most users have been exposed to Pennies 4 Profits through safelist marketing. If these leads were converting so well, why would anyone be wasting their time promoting this on safelists? Warrior forum discussions indicate that accounts currently accounts are being cancelled and refunded without explanation. At least they seem to be refunding the customers! The $30 setup fee is a bit strange, what do they actually need to set up? And is purely coincidence that this brings the 1st months billing to $60, once again very similar to Submission Works and Twice Confirmed Traffic? And finally apart from the above, just take a minute to remove the hype from the sales page and emails ads that brought you to research this product. Do you really believe that high converting leads can sell at $0.01 per lead? Do you really think that any company can deliver 100 high converting, exclusive leads every day to you and all their other customers? Final Conclusion: Pennies 4 Profits is likely a scam – stay away from it! If you are considering purchasing this product, it probably means you are looking for means to make a living online. You’ve probably tried many things before and ended up spending more money than you are earning. Or worse, you’ve yet to make any money at all and are jumping around to the next big thing that comes around. The sales pitch is designed to draw you in based on those very emotions, creating a hope that you have finally found that hidden gem that will generate some sales and is easy to use, that this time things will be different. I know how hard it can be when you read testimonials from customers claiming to have made sales, and you find yourself thinking that it’s your turn to have those same results. Unfortunately you can’t trust all reviews that show up online, and you need to be skeptical. Especially when a product is freshly launched, because with a good search engine optimization the owners & their eager affiliates can dominate the top search results for weeks before the true reviews start showing up. I used to be in the same boat as you. Fortunately I did find the thing that I was looking for. It’s not a magic push button solution, but an honest ethical way to start earning online. And it comes with free trial, no strings attached. Click here to read my Wealthy Affiliate review. And yes, you should be sceptical about it, as for any online review. But at least you can try before you buy (where else will you find that), so there’s no risk to check it out. Do you have any questions about what I’ve explained? Are you a current Pennies 4 Profits customer and would like to challenge my view? Leave me a comment below and I will respond. They are not only scamming… They also steal credit card data. If you ever dealt with one of their sites you’d better pay close attention to the account of the credit card you used with them. Good you spread the word ! Thanks for pointing that out Thomas, I was not aware that they are abusing credit card information as well. It is a real concern that whomever is behind these websites are able to continue with their next big launch. It seems hard to stop them but spreading the word is a start. Just want to give some more info about this: I cannot proof they stole the data but: TwiceConfirmedTraffic was the only website I used my card on in 2014. Didnt make a single other online purchase with it. Soon after cancelling my account my card started to get charged by dozends of online shops…. I simply have no other idea of how my card data could be compromised…. So I’m just recommending that customers of these sites pay attention… Maybe it was just a coincidence and my data was stolen another way… but I cant think of a possible scenario of how that would have happened when the card wasnt used for anything else except at ATMs…. I would also like to point out that the email marketing that is done by “affiliates” of P4P is in reality coming from the owners. Their “affiliates” used pennies4profits.net and .org in their emails. ( As of 17.10 they stopped that and use affiliate links now… ). A search on scamadvisor shows that these domains are hosted on the same server than the .com. So they likely belong to the owners. Thanks Thomas, some insight into the Pennies 4 Profits scam which I’m sure other readers will find interesting. I call BS on your stuff above. I enrolled int P4P. I have been with them for 2+ months but have only mailed the list a few times. I was waiting on something to be completed before emailing my opportunity so I have only sent about 6 email to the group but I have over 7600 leads downloaded and I have name, email address, IP address & time& date of request. To say that your card was scammed by them is ignorance at best. A year ago (prior to P4p) my debit card was charged for 2 amounts of $200 at an ATM in NY City. I have never been to NY City and the bank caught it. This stuff happens all the time. but anyone who buys that your experience was due to doing business with these guys are also ignorant. Are they good leads? So far I have had no conversions into says but I have not consistantly mailed ot the list. I can see that open rates. So far the top was 20% open rate. That’s a fair enough point Phil, we can’t always pinpoint the source of credit card thefts. But back to P4P – you mentioned your open rate, but are you actually getting any actions from the mails? Are there any click troughs on your links? I think we got to be careful with this product. I almost bought it because of some guys’ positive reviews in the Warrior Forum. I’m glad that I did some re-checking in Google and found this article which led me to check if there is any thread in the Warrior Forum on Twice Confirmed Traffic and Submission Works. I found some and it seems that the guys who gave positive reviews for Pennies 4 Profits were also the guys who gave positive reviews for Twice Confirmed Traffic and Submission Works. It seems that they also like to reply to each other in those threads. So I contacted one of the moderators to check on these guys. I gave him the names. The mod came back to me and said that “the IP addresses all appear to be the same.” He also deleted the thread on Pennies 4 Profits. Well, I don’t think a company who do that kind of promotion is a credible company. Some great detective work there, Mohamad! I have always been suspicious of the reviews on the Warrior Forum for all these products (Twice Confirmed Traffic, Submission Works and Pennies 4 Profits). But I have not connected all the dots like you did – well done! I have noticed that the positive reviewers seemed to have joined the WF around the same couple of days. And for all these products they always seem to be ready to start the threads and top then top them with positive reviews, until eventually the real, honest reviews start to come in. The same applies to Google search results. They seem to know enough about SEO to be able to have fake reviews ready to dominate the top search results at product launch. Combined with the WF fake reviews, it takes a long time for the real reviews to filter through. But even then some potential buyers will compare the good and the bad reviews, and still decide that they could be one of the ‘lucky’ ones with the good results. Good on you for taking things further and reporting it to the Warrior Forum! And thanks for taking the time to post here and share your findings, it will help other readers to avoid this scam. Your welcome Jude. Unfortunately the scammers are using fake review sites as well to scam potential customers even more. The only thing we can do is to share what we know by blogging & sharing posts, and hope that prospective buyers find the truth before they lose their money. And to think I have been saving my money to try to come up with the 60 bucks to get started. I wondered the same thing about the $30 set up fee. What set up is there? I should’ve smelled scam all over that. I too found pennies 4 profits being promoted in a safelist. Think I’ll run. Thanks for the honest review. Glad you didn’t go through with the buy Heather. That is what posts like these are about. It takes time to maintain a site and write honest reviews with proof and detail. But if just person walks away and saves $60 – that makes it worth it! Thank for being willing to post your experience here John. I’m sure there will be some who will only take the advice of someone who has been on inside, and I hope they read this post and realise that Pennies 4 Profits does not work and does not produce results. If you are still searching for success online, I highly recommend you check this out. I have noticed the same thing as the commenter above. Basically two different affiliate marketers send nearly all the emails out on tons safelists promoting pennies4profits. The introductory Youtube video on the main site has horrible audio and the two dudes in the video sound like they are reading a script. Not very genuine or professional. I would skip the pennie4profits offer personally. Spot on Wade – the videos on websites like these are usually done by specialist voice recording artists. P4P, Twice Confirmed Traffic, and Submission Works are promoted exactly the same way with the same strategy. They are on the look out of recently launch or high converting MMO (money making opportunities) and some how get those emails to send their offers. Their targets: Empower Network, Wealthy Affiliates, 4 Corners, and many others. They inform you of how wonderful has been the respective software (p4p, sw, or tc) getting leads and signups for those programs. Extactly the same ads but with the change of the name of the software. After they have exhausted one software, they come with a similar one with a new name. Expect that after a few months you will receive similar promotions, but with a new “marvelous” software that will get you leads, signups for the pennies. They are expert marketers, the enticing to join is great, even after seeing these scam reports. Very sensitive people will still give them a shot, even after these warnings, some will come back asking how to get a refund, others will seclude themselves ashamed of their acts. True, the scary part is that a new program appears every couple of months, and still they manage to convince people to part of their hard earned money with the empty promises of finally making some money on the web. If only more people would try the Wealthy Affiliate Free Starter Account, in stead of looking for a magic button. For $30 setup fee and $30 per month you get 135 leads every 24 hours. Thanks for pointing that out. I just checked out USA Lead club, it looks exactly like another scam by the same owners, The Terms & Conditions page is actually identical! This P4P site is covertly run by the Timtech crew so says a reliable source on the inside that used to work for them. They have a handful of sites that are run openly but also a variety that are “ghost” run. It all started with the semi-legit traffic site, I Love Hits years ago and spiraled out of control since then. They are also in cahoots with the creator of hypervsp and clickbank demon. Hard to comment without proof, but quite concerning nonetheless. Timtech produce some good products like tracking, and their autorespsonder is supposedly quite good. But as far as traffic exchanges go, only the owners make real money out of them, and I would stay clear of them. Been with Pennies4Profits for 6months. I think the “open rates” is fake. I did the same email ads with Herculist, and got 217 sign ups and 8 sales and their mailings are free. Ok,in this case I paid for the extra $20 mailing, but look at the results I got. I’m paying $30 per month to Pennies4Profits and no click throughs, no sales…only fake “open rates” . A minute ago I try to cancel the membership and was redirected back to the support page. This is not good. Don’t touch Pennies4Profits. Definitely a scam. Thanks for commenting Ingrid. I am surprised that you managed any sales with Herculist – I have read many reviews that indicate its about useless as P4P etc. Most people have a special email just for that purppose and never open emails from Herculist. As for Pennies 4 Profits membership, they usually respond to membership cancellation. You will probably get a message asking if you need extra support in using the service, etc. Just ignore and be sure to confirm that you want cancellation. I’ll follow up this post as to how this turned out. That’s good news. Keep us posted with the outcome. I agree that they are SCAM. I wish I saw this review before using them. I used them for almost a year now. The number of leads I am carrying now is more than 33,000. Every day I see that 10-12% opened my message. BUT using a tracker, I found out not only I am not getting sign ups but there was not a single click on the link. They just renewed my subscription for this month. This is the second day. As there is no obvious way to change the billing details, I sent a support request to change my credit card details. Guess what?!! They sent me a link to update my billing details and at they same time they cancelled my account. So upon request the sent me a new password. With that password I only can go to the billing details update page. I don’t know why my debit card was not accepted but now I cannot access the account for what I already paid for. So now, I just will wait until next month and see if they will continue charging my previous credit card. Or I will talk to the bank to just replace it. What am not hearing from anyone here who have posted is how did the product play out for you after making your purchase??? One person bought haven’t been sending much mailing to the leads with reporting of a 20% click through rate. What I hate most about online reviews are affiliate giving “honest reviews” instead of real customers; newbies who don’t know a thing about marketing online making superfluous and grandiose statements about products they have no knowledge about; dirty bad minded competitors tearing down another product owner and boosting their product as the only alternative and persons who never bought having the “reliable information” to give simply be second guessing what the product is all about. Why is the online marketing world so fake and deceptive?? Fake reviews are a real problem. I blame the self proclaimed gurus & experts who teach newbie’s that this is they way to make money online. The reason I did not buy the product this time was because it was clearly just a different version from a site where I have lost my money before. Thanks for this awesome Pennies4Profits review. There’s one doubt I have on this program is whether they are sending the same leads to all their members. Because they are giving each member 100 leads per day. There’s no way they can get so many emails. I think you are right, the business model does not makes sense.